It's cleanse and polish's fifteenth anniversary. It's only 13£ (for the started pack and 11.50£ for just the 100ml pump) and i've discovered it's cult for a reason. I have a very snobby skin routine (cleanse, exfoliate, tone and moisturise, mask on occasion) but this has changed everything. This one product cleanses and exfoliates. 'Phase 1 is the cleansing. Free from mineral oil, it has a rich and creamy texture and swiftly removes all traces of face and eye make-up, even stubborn mascara. 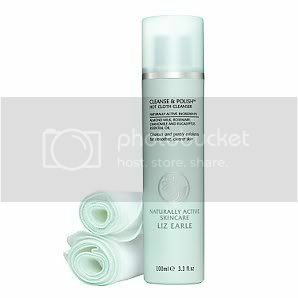 You can either have a lifetime of beautiful skin or that one perfect pair of in season shoes (to be exact, Alexander McQueen's Angel Black Shearling Leather Boot price = 695£ , 695 ÷ 11.50 = 60.43 tubes of liz earle cleanse and polish instead of those oh so darling shoes).